Veteran bassist Charlie Haden worked frequently over the years with the young pianist Gonzalo Rubalcaba, and in a variety of ensemble formats. In 2005, the duo had a four-night residency at the Blue Note club in Tokyo, and this exquisite disc is drawn from those performances. The title reflects two things: first, the all-ballad nature of the program; second, the fact that Haden often referred to himself as an “adagio guy”–someone who loved slow movements. To listen to this gentle and delicately powerful program is to reflect again on how deeply blessed the jazz world was by the long presence of Haden, and continues to be by the sensitive virtuosity of Rubalcaba. Because this music is so soft, slow, and luscious, it’s tempting to treat it like ambient music–to let it fade to the back of your consciousness and simply color the air around you in deep, rich shades of blue and purple. There’s nothing wrong with doing that, but I strongly recommend taking the time to listen closely to it, at least once and maybe even repeatedly. 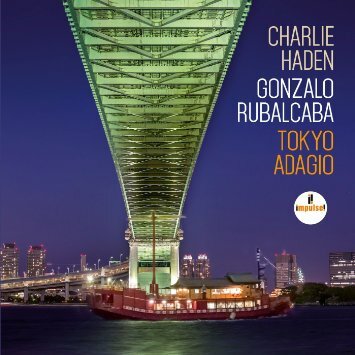 Haden and Rubalcaba communicated with each other in a way not seen since the glory days of Bill Evans and Scott LaFaro, and both of them play here with a sweetness of spirit and an openness of heart that has to be heard to be understood. I realize that may sound a bit overwrought, but trust me on this. Every library should own this album, and I’ll go further and say that every home should as well. Here’s hoping, someday, for a box set documenting all four nights of their residency. 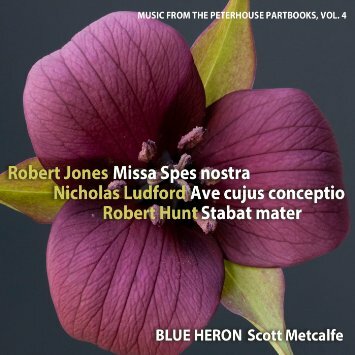 Like a glass of cool water after a long walk in the desert, the fourth installment in the Blue Heron ensemble’s projected five-volume series of music from the Peterhouse Partbooks is finally here. And like its predecessors, this one presents gorgeous and previously-unheard music by practically unknown composers, all sung with the sweet and burnished tone and colorful but seamless blend that are Blue Heron’s hallmark. No classical collection can afford to pass up any disc in this series. Contemporary and lyrical? I’m in. 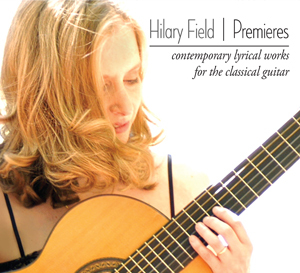 And guitarist Hilary Field doesn’t disappoint here: these pieces (by composers like Douglas Lora, Nadia Boríslova, Alberto Cumplido, and Field herself) are modern and sometimes forbiddingly virtuosic, but always engaging and sweetly melodic. Well, to be honest, most of them don’t sound that “modern”–Field’s use of the word “contemporary” in the title is wise. And her playing is magnificent. Highly recommended. Speaking of modernism and accessibility, here’s a program of 20th- and 21st-century string quartets consciously designed both to celebrate cultural differences (the featured composers come from the four different countries represented by the quartet’s membership) and to encourage transcendence of them. South Africa is represented by Kevin Volans’ now-familiar second string quartet (subtitled “Hunting:Gathering”); Japan by Hajime Koumatsu’s Japanese Folk Song Suite No. 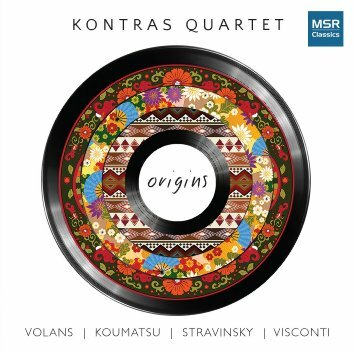 2; Russia by Igor Stravinsky’s Three Pieces for String Quartet; and the United States by Dan Visconti’s witty 11-movement Ramshackle Songs for String Quartet (presented here in its world-première recording). The playing is great and the program thoroughly enjoyable in all its diversity. It may seem like a curiosity now, but in mid-18th-century Berlin compositions suited to the five-string cello abounded: composers like Carl Friedrich Abel, Carl Heinrich Graun, and J.C.F. Bach were writing chamber works that favored the use of a cello with five strings. 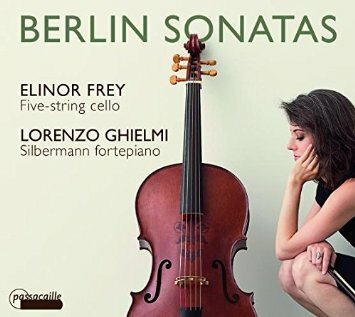 Elinor Frey is one of a very few cellists currently exploring this repertoire with that instrument, and on this program of sonatas she is accompanied by the fine fortepianist Lorenzo Ghielmi (who is also featured on a mid-program solo piano sonata by C.P.E. Bach) and bassist Marc Vanscheeuwijck. The music is all very enjoyable and this album should be of particular interest to library collections. This trio of pianists includes Hans-Joachim Roedelius, whom attentive readers will recognize as a founding member of the avant-garde group Cluster, and attentive readers will also note the similarity of that group’s name to this one’s–and will thus be tipped off and will expect this music to be something other than what one traditionally thinks of as “classical.” The music is minimalist in the harmonic sense, developing (if that’s the right word) along lines that suggest wind chimes; however, the textures and overall mood are nearly Romantic, and the pianistic techniques used are extended enough to suggest hints of mid-century modernism. Very interesting and quite enjoyable, and a good choice for more inclusive classical collections. The third disc in this ongoing series showcases two very different Schubert compositions, each in a four-hand piano arrangement created without the composer’s permission. In this case the originals are both quite familiar: the “Death and the Maiden” string quartet, and the “Unfinished” symphony. 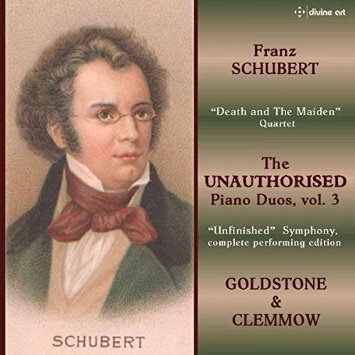 The arrangements are a by a variety of Schubert’s contemporaries and near-contemporaries and by pianist Anthony Goldstone, who represents half of the performing duo on this recording. This is a lovely album of world-première recordings and should be of special interest to any library supporting a program in orchestration or keyboard arranging. The late 15th century was a fascinating period of transition for polyphonic music, and a period during which giants were being born and educated in northern France and Belgium: Josquin Desprez, Jacob Obrecht, and Alexander Agricola were all born at this time. 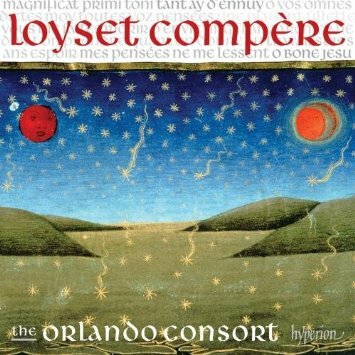 Loyset Compère was born about ten years earlier–long enough to give him a head start on developing the imitative choral techniques that would later be arguably perfected by Josquin. This collection of sacred and secular pieces (sung with breathtakingly crystalline clarity by the four-voice Orlando Consort) shows Compère off very nicely, particularly on the exceptionally fine Magnificat setting. Highly recommended to early music collections. 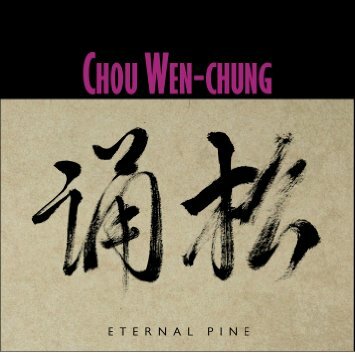 Though he is now over 90 years old, the compositions on this album mark the first time that Chou Wen-Chung has composed for ensembles of traditional East Asian instruments. This album features four versions of the title piece: one for a traditionally-configured Korean ensemble, one for a sextet of Western instruments, one for a duo of gayageum and changgu, and one for a septet of traditional Chinese instruments. The music itself is highly impressionistic, almost programmatic, and the contrasts between the different renderings of a single set of musical ideas is fascinating. The title here is taken from a satire written by Ben Johnson, sending up the court of Queen Elizabeth I. The Queen was well known for her love of music and dance, and the satirical play included a number of songs and dance sequences. 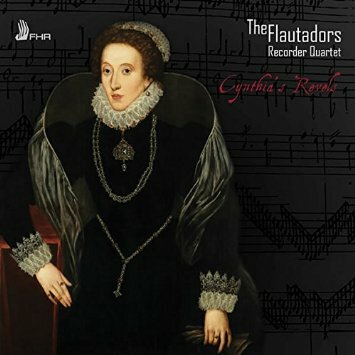 For this album, the recorder consort The Flautadors gathered together pieces by composers as familiar as William Byrd, Anthony Holborne, and John Dowland, and as obscure as Elway Bevin and Hugh Aston, to create an imaginative re-creation of the sounds of courtly life during the Elizabethan era. Their playing, as always, is superb, and the lovely tone of their instruments is particularly worth noting: here they’re playing a consort of recorders built by Thomas Prescott after 16th-century instruments currently housed in the Vienna Kunsthistorisches Museum. 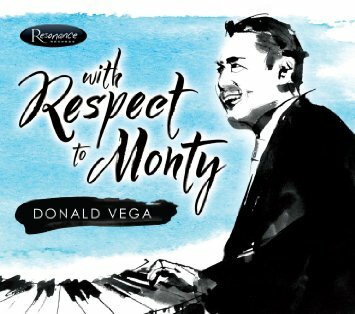 This effortlessly enjoyable disc simultaneously celebrates two great but underappreciated pianists: Donald Vega (who took the place of the late Mulgrew Miller in the Ron Carter Trio) and Monty Alexander (the Jamaican pianist/composer who has done more than anyone except the Skatalites to fuse jazz and reggae, while also working in both of those genres separately). 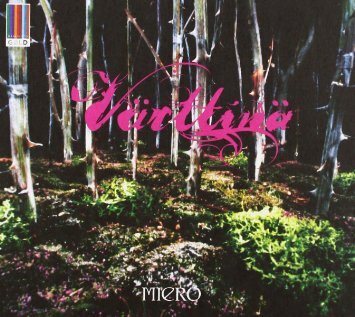 Vega plays in tribute to Alexander here, working in a quartet format (piano, guitar, bass, drums) and delivering a program made up mostly of Alexander’s compositions. One selection is reggae and one is Latin, but for the most part Vega sticks with what he does best, which is to swing powerfully in a straight-ahead style. His lilting and lyrical solos are a consistent high point, but his rhythm section deserves enormous credit as well for the utter delightfulness of this disc. Strongly recommended to all jazz collections. 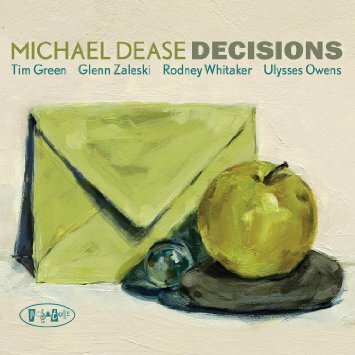 I have a real soft spot in my heart for trombone-led small combos, and this quintet date led by trombonist Michael Dease is a treat. It features a blend of originals and arrangements (only a couple of which could reasonably be called “standards”), and is unapologetically straight-ahead in style. To listen closely to Dease is to hear a mind sharply but affectionately at work on these melodies, making subtle allusions and throwing out the occasional tribute to a friend or hero, and the rest of the quintet supports him with both empathy and power. Very, very nice. 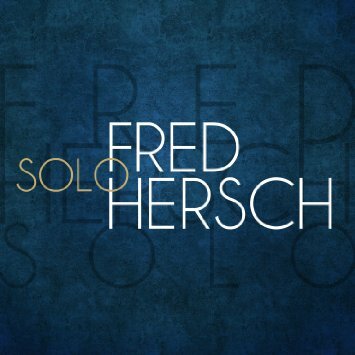 By now there’s not much point in reviewing Fred Hersch’s albums. You know that his trio and small-combo sessions will be thrilling, mind-expanding excursions in the straight-ahead tradition, and you know his solo albums will take you into unexpected realms of harmonic invention and stylistic expansion without ever leaving you bewildered by the roadside. In celebration of his 60th birthday, the Palmetto label has released this live recording made a year ago in a small church in the Catskills. During this set he played several originals, a Jobim medley, standards by Duke Ellington and Jerome Kern, and (of course) a Monk tune — a set perfectly designed to show off his strengths, though “showing off” is never the impression Hersch gives. Instead, you get the impression he’s reaching out to you even as he dives deep inside himself to pull out genius musical thoughts. An essential purchase for all jazz collections. The last trio album led by pianist/composer Lafayette Harris was a standards program; this one focuses on originals, and it’s very good indeed. 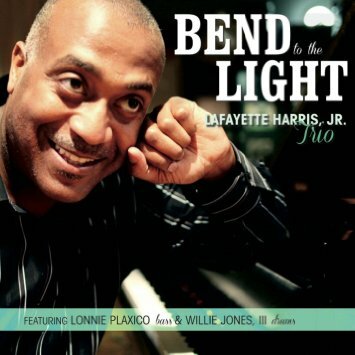 As a writer, Harris can do impressionistic (the title track), contemplative (“We in the House”), or hard-swinging (“Achern,” “Blues on the Edge”); when he’s doing other people’s stuff he can take it into either stride (Herbie Nichols’ “12 Bars) or gospel territory (Luther Vandross’s “Take You Out”). His stylistic range is impressive, and his touch is light but solid, as is the accompaniment by bassist Lonnie Plaxico and drummer Willie Jones III. Strongly recommended. 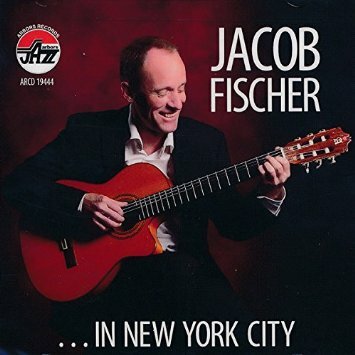 Jacob Fischers follows in a long but sparsely-populated tradition: that of jazz guitarists who use a classical, nylon-string acoustic guitar. Here he is accompanied by vibraphonist Chuck Redd (who has recorded with another very fine jazz/classical guitarist, Nate Najar), bassist John Webber, and drummer Matt Wilson on a set of standards–but with some little surprises thrown in. For example, Fischer uses a bottleneck slide on “Love for Sale” (not something you usually hear in a jazz context, let alone with a classical guitar), and he fairly rocks out in his intro to “Puttin’ on the Ritz” (and brings out the slide again on his solo). If there’s a place in your jazz collection for a guitar album with a difference, definitely consider this one. Ian Tyson is something pretty rare these days: a successful and internationally-acclaimed cowboy singer who’s actually a cowboy. Now 81 years old, he’s been on the scene since the 1960s (when he performed as one half of Ian & Sylvia), and for his latest album he has put together a grittily lovely collection of original and traditional songs. His voice has been abused over the years by both heavy use and unfortunate circumstance, but he sounds quite good here, and the songs themselves are great — as is the tastefully understated backing he gets from a quartet of friends. A highlight is his new version of “Darcy Farrow,” a now-popular song that he was first to record back in the 1960s. 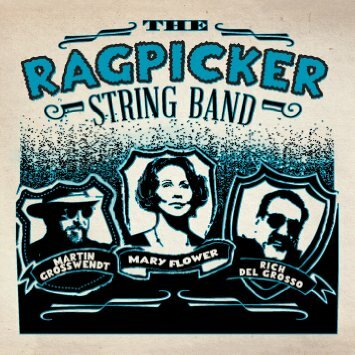 This project is a collaboration of guitarist Mary Flowers, mandolinist Rich DelGrosso, and multi-instrumentalist Martin Grosswendt, all of whom also sing in tight harmony. Though they call themselves a string band, don’t expect fiddle tunes. What they do is old-school blues and Tin Pan Alley stuff: songs by the Mississippi Sheiks, Sleepy John Estes, and the like, with a smattering of old-sounding originals thrown in and even a version of Thelonious Monk’s “Blue Monk.” It’s all tons of fun, and the trio’s virtuosity is easy to miss unless you listen closely. 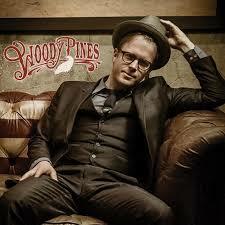 Billed as a purveyor of “country blues, rag time, and viper jazz,” Woody Pines is that and more. He’s also a purveyor of fine original songs that draw on those traditions and others as well: “This Train Rolls By” evokes Tom Waits and Woody Guthrie simultaneously, “New Nashville Boogie” evokes Hank Williams and the Andrews Sisters simultaneously, and his version of “Junco Partner” manages to avoid evoking the Clash at all. Recorded warmly but cleanly (none of that lo-fi pretense for him, and bless him for it), this album provides plenty of good rootsy enjoyment. Anyone who thinks country music all sounds the same hasn’t spent enough time listening to country music. 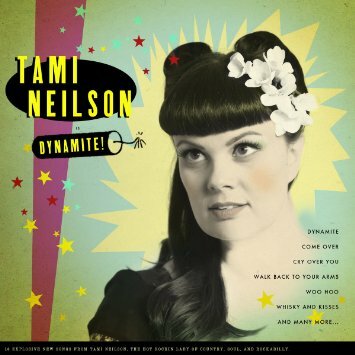 Consider, for example, the wide variety of styles evinced here on the fifth album by Tami Neilson: you’ve got your spooky torch-song country (“Walk”), your straight-up honky-tonk weeper (“You Lie”), your country-billy raveups (“Come Over,” “Woo Hoo”), your Hank Williams-style lovergirl come-on (“Texas”), and much more. All of it is fantastic, and this disc would get a Rick’s Pick if it weren’t for the producer’s mistaken belief that crappy microphones=retro authenticity. Young roots musicians continue pushing the boundaries of traditional bluegrass — a process that has been ongoing since the Country Gentlemen first covered Bob Dylan in the 1960s. 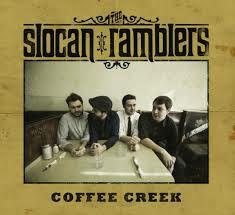 The Slocan Ramblers do it a bit more subtly by, for example, doing “Groundhog” in a minor key (with a nice harmolodic mandolin solo thrown in for good measure), and by featuring virtuosic clawgrass banjo on the title track. The vocals are rough-hewn but the harmonies are tight, and all the arrangements are interesting — several are thrilling. Recommended. Contradance music is an underappreciated genre in the folk world, one that has its own conventions and idiosyncrasies that set it apart from the more commonly-known stringband and squaredance traditions. In New England and eastern Canada, the piano often figures prominently in the ensemble, and tunes can come from just about anywhere. 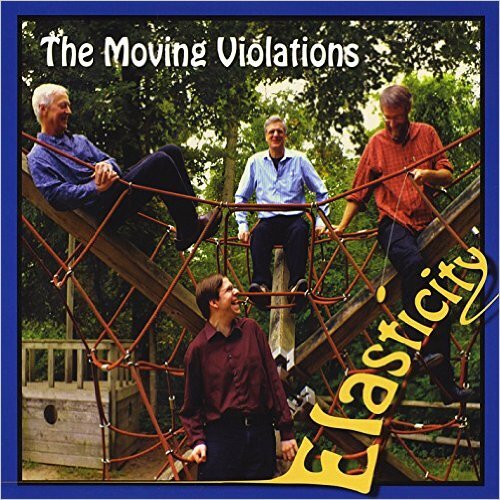 On the Boston-based Moving Violations’ third album you’ll hear sets of tunes that come from Klezmer, Scandinavian, Texan, French Canadian, classical, and Irish repertoires, and you’ll hear jazzy improvisational excursions that you might have a hard time imagining people dancing to. But it all works, and it’s tons of fun. This is the debut album from Kerry Leathem, recording under the name Roseau, though she has appeared on numerous projects by an array of artists as diverse as Bonobo, Lianne La Havas, and Lapalux. On her own, she’s a thoughtful and somewhat shoe-gazey electropopper with a taste for sharp but subtle hooks and archaic drum machine sounds. I find her unapologetically Cockney accent charming, her sideways glances at hip hop intriguing (check the wacky “New Glass”), and her mastery of multiple instruments impressive. This album is something of a stylistic departure for the Big Dada label, and more power to them. Longstanding fans of singer/songwriter Marshall Crenshaw — famous for the architectural perfection of his retro-pop songs (and for playing Buddy Holly in the 1987 film La Bamba) — may be a bit taken aback by the dark, sometimes slightly sludgy sound of these songs, which are taken from a series of vinyl-only EPs that Crenshaw released between 2013 and 2015. 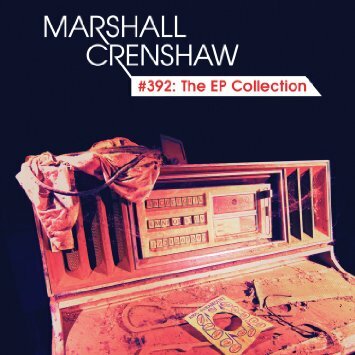 Half of the songs are Crenshaw originals and half are covers of songs by the likes of the Carpenters, James McMurtry, the Everly Brothers, and the Lovin’ Spoonful. Those who might have underrated his guitar playing in the past will no longer have any excuse to do so; those who appreciate pop music with a dark undertow and an understated complexity (and who don’t own turntables) will have reason to rejoice. Former avatars of the Big Beat movement, the Chemical Brothers now return after a five-year break from recording conventional albums (they’ve been doing film music) with a long, dark, and glowering album of what can only be called post-electro. 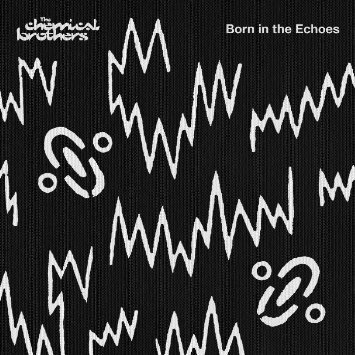 It’s still electro, of course — still drum-machine-based and sample-heavy — but the new Chemical Brothers sound is no longer wedded to any particular concept. The beats tend towards the housey and thumping, but the sonic textures are wildly various and the guest vocalists feature artists as disparate as Q Tip and St. Vincent. If you’re new to the ChemBros I wouldn’t start with this one, but for established fans there’s much here to love. 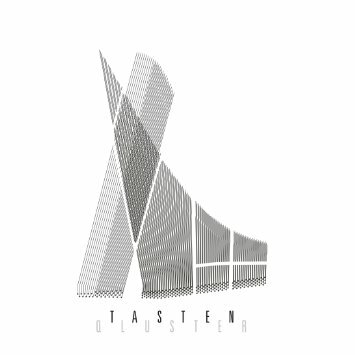 Man, I’m a sucker for this stuff: spaciously conceived, darkly but warmly produced electronic music with a strong hint of groove but rarely a completely explicit expression of it, with voices fading in and out in a dubwise fashion. 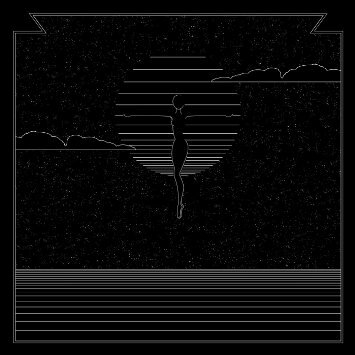 Synkro came up in the dubstep game but has expanded his horizons considerably, and what he’s offering here is some of the most poignant, experimental, and quietly compelling electronic music I’ve encountered in some time — and I spend a LOT of time listening to electronic music. Very highly recommended to all libraries. 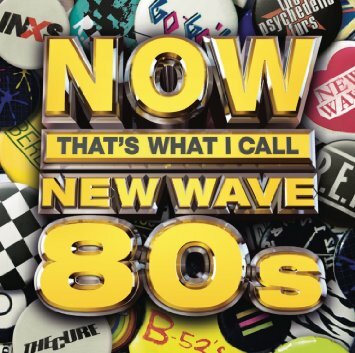 The Now That’s What I Call Music compilation series has now been running for over 30 years, with enough consistent success that it has spawned a number of spin-off series, including a dance line (featuring 12″ dance mixes) and a series of karaoke recordings. The latest such foray is a collection of “post-punk alt-rock New Wave” singles from the late 1980s, offered on CD in an 18-track version and also in a deluxe download-only version featuring 40 songs. Those who were teenagers during the time period under examination here might question the New Wave designation in some cases — the B-52s and Human League, okay, but Big Country? REM? Anyway, academic quibbles aside, this is a fine overview of the wide variety of pop and rock sounds from a particularly exciting period of pop music history. 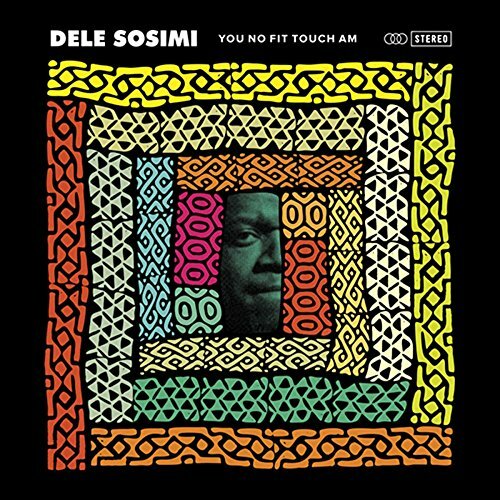 If you yearn for the glory days of 1970s Afrobeat, then this album by vocalist, keyboardist, and Fela Kuti collaborator Dele Sosimi will be hugely welcome. The hypnotic weaving of palm-muted guitars, heavily syncopated horns, call-and-response vocals, and churning drums will make you want to party like it’s 1975 (in Lagos), and in this country you won’t even get arrested for listening! Bonus: the production quality is excellent, so you can hear every layer of instrumentation and every voice with crystal clarity. Recommended to all world music collections. Peter Gabriel’s Real World label is responsible for some of the coolest releases of the 1990s, bringing adventurous cross-cultural bands like Afro Celt Sound System, Little Axe, and Sheila Chandra to the attention of Western audiences who might otherwise never have heard of them. The label’s Real World Gold reissue series is bringing some of those classic releases back to market now, and among the most recent batch (which also includes excellent albums by Nusrat Fateh Ali Khan, the Drummers of Burundi, and Daby Touré) is this exhilarating collection of Finnish folk-rock by Värtinnä, whose high-energy sound, complex rhythms, and tight, reedy harmonies are unlike anything you’ve probably heard before. This reissue series provides a great and affordable opportunity to beef up your world-music collections. 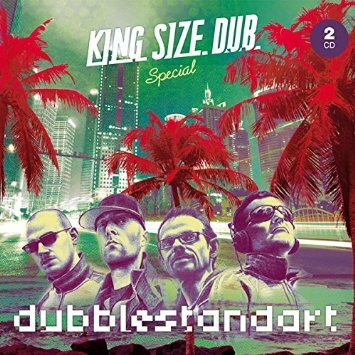 The brilliant Austrian reggae band Dubblestandart has made its mark by doing a couple of things exceptionally well: serving as the go-to backing band for A-list reggae artists like Lee “Scratch” Perry, Dillinger, and Ken Boothe, and producing forward thinking (sometimes bordering on avant-garde) electro-dub music for the new millenium. 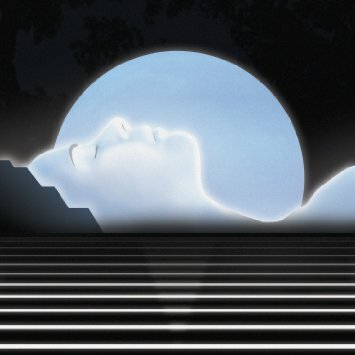 In anticipation of an album of new music to be released next month, they have issued this two-disc set of classic tunes, unreleased material, and new mixes contributed by producers like Robo Bass Hifi and Adrian Sherwood. (The second disc, not provided for review, consists of sixteen mixes of the song “Holding You Close,” featuring Marcia Griffiths; the snippets I’ve heard suggest that this second disc alone is worth the purchase price of the album). As always, the playing and writing are top-notch and the grooves are strictly heavyweight. A must for reggae collections. If you’re an American CD HotList reader, there’s a decent chance you’ve never heard any Arabic pop music whatsoever, since in this country you’d have to go pretty far out of your way to encounter it. In that case, consider this collection a must-own: it offers examples of Algerian jazz-rock fusion (Anis Benhallak’s “S’ayda”), crooning Jordanian folk-pop (Dozan’s “Ya Mo”), feminist Middle Eastern singer-songwriter fare sung in Hebrew (Limor Oved’s “Blessed for Making Me a Woman”), and gnawa-infused Afrojazz (Gabacho Maroconnection’s “Moussaoui”), among other new-old/west-east fusions. 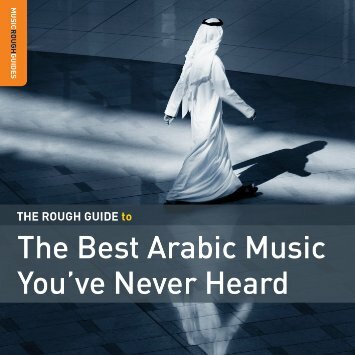 Libraries that already collect deeply in the music of the Arabic world can probably skip this one, but it should be considered an essential purchase for any library that needs a good single-disc overview of the current state of the art in modern Arabic music. I’m always interested in funky South Asian devotional music, and this is some of the best I’ve heard in a long time. Here singer Marti Nikko teams up with producer/beatmaker DJ Drez on a program of yoga music equally suited for meditation and dancing (which is quite a trick if you think about it). Nikko leads the incantations, DJ Drez builds the multilayered funk and dub sound structures, and whether you pray to 100 gods or to zero or to some number in between, you’ll find yourself quickly caught up in the irresistible grooves. Very highly recommended to all library collections. 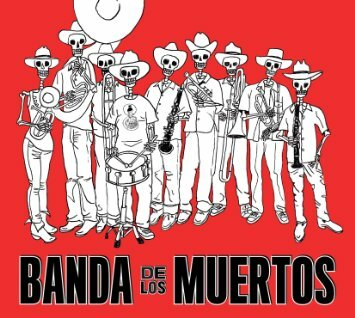 You may not be familiar with banda as a genre designation, but I promise you’ve heard banda, the indigenous brass band music of the Mexican state of Sinaloa. Upon first encountering the playing of this Brooklyn-based ensemble, at first blush all you might hear is cheesiness: those sobbing trombones, those polka rhythms, those Mexican-hat-dance melodies. 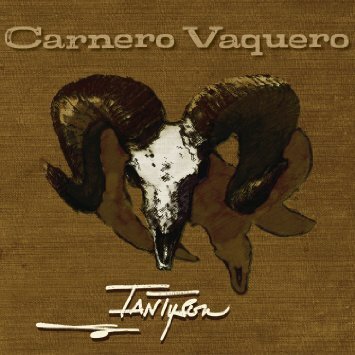 But listen more closely and you’ll hear grace and intricacy and startling virtuosity: check out the clarinets on “Tragos Amargos,” the trumpets on “El Toro Viejo,” and the sousaphones everywhere. You’ll also hear brilliant arranging: check out this group’s marvelous arrangement of the Marty Robbins classic “El Paso.” Best of all, there’s not a hint of irony anywhere. This is genuine music, played with genuine love and transcendent skill.